Orange uses support calming and peace. It is rich naturally occurring d-limonene. Use orange essential oils to promote feelings of peace. Orange uses were first discovered by the Chinese centuries ago and since have remained as a vital part of Chinese culture. Traditionally they used orange to support healthy digestion, and bring good luck! Did you know that Orange Essential Oil contains 85-95% limonene? It has the highest level of d-limonene next to grapefruit oil! D-limonene is contained in the peels of citrus fruits such as grapefruit, tangerine and lemon. The simplest way to benefit from Orange is to use Orange Essential Oil. Orange oil is always available and it is simple to use! Just add a drop to your favorite meal, drink or water. Or diffuse for an emotional lift! Either way, orange oil is a welcome addition to home or work! My favorite blends that contain Orange essential oil are Peace & Calming, Inner Child and Into the Future oils. More orange uses? There is more! Keep reading for more information on how to use it and what to use it for. This section will also provide you with some fun suggestions, safety precautions for you and your pet! As I receive new tips and testimonials for Orange Essential Oil they will be added to the page, so check back frequently! 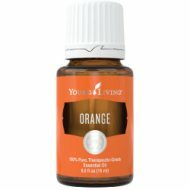 Want to Purchase Therapeutic Orange Essential Oil? What is the Genus Species? Citrus sinensis. Technically this is Sweet Orange. Orange is of the species Citrus aurantium. By the way, extraction from the flowers of the orange is considered Neroli. Neroli is an absolute named such according to the extraction method, as with Jasmine! Why is this information important? It’s always important to know your genus species of your oil. Just the common name on the bottle doesn’t really tell you exactly what you’re getting, so please know both! Where did the name come from? It is thought the name is derived from Sanskrit meaning “orange tree”. What are the Plant Properties? Calming and relaxing. What are the Documented Orange Uses and Benefits? May support normal cellular regeneration; ease stress. Flavor your water or beverage. What is the Aromatic Affect on the Mind? Its fresh and citrus aroma is very uplifting to the body and mind. What is the Spiritual Influence? Orange uses include the spiritual and emotional realm as well. Orange releases self judgment, obsessions and fears so the emotional body can be restored and balanced. When we release these negative and highly charged emotions we can see clearly again and make better choices for our life. It will lend support by uplifting and promoting a positive attitude while calming our spirit. This oil will help those who tend to overwork, strive for perfection, but get aggravated quickly by intolerances or mistakes. Interested in Dietary Orange Oil for Your Culinary Adventures? Then check out Orange Vitality Essential Oil! Can this Oil be used for Pets? Yes, orange uses include our pets! Great to add to your shampoos for fragrance and your stress relieving blends! See the introduction for many of the blends I use all the time at the barn! Note about Animal Use: Certain oils can be very toxic to cats. Citrus and pine oils in particular which contain non therapeutic grade oil! Please consult your vet if you are not sure about applying any essential oil to your pet. What are the Safety Precautions? Only therapeutic grade essential oils should be used for best results. Because it is approved as a Food Additive (FA) by the FDA, Orange Oil is readily available on the market in many different qualities. There are many orange uses because it is Generally Regarded as Safe (GRAS). Photosensitive – avoid direct sunlight for up to 12 hours after use. Did you know that Brazil is the largest producer of orange oil with the United States in second place? Did you know that the Chinese first discovered that the rind has the most beneficial value? The white part of the rind contains the highest amount of Vitamin C in the orange! So pare your orange and eat the white part too! Go to the Oil Shop! Buy Orange Essential Oil Here! Diffuse orange in your work space to relieve stress and uplift the environment!